Four shapes can be rotated and flipped either horizontally or vertically. Position the shapes in a way that perfectly fits the main figure! 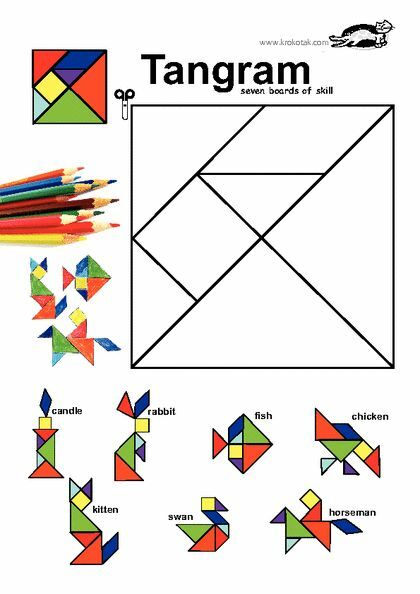 Sample activities that can be done with tangrams. A set of instructions to create your own set of tangrams. This activity incorporates both tangrams and fractions. The Tangram puzzle was invented by the ancient Chinese hundreds of years ago. It is a square broken into seven pieces. When rearranged, these pieces form a great variety of shapes and pictures. This puzzle provides an excellent background for determining fractional parts and wholes. Use 7 different geometric shapes to make fun pictures. Tangram puzzle cut out activity. ABCya! Tangrams are fun for children of all ages. Complete the puzzle by moving and rotating the seven shapes. A fun way to work with shapes.